Whenever I hear a half-decent band describe their upcoming record as “experimental,” I find myself afflicted with a sort of low-level split-personality disorder. Half of me wants to clap them on the back and praise their boldness, while the other 50% wants to give them all a good slap for risking disaster so needlessly. Wolves in the Throne Room did just this to me with their 2014 outing Celestite, which emerged from the womb sounding more like Kraftwerk’s morbidly obese stepsister than the fare of an accomplished black metal act. Some loved it; I, alas, did not. When I looked up their latest offering, Thrice Woven, therefore, it was a palpable relief to learn that the band intended to return to their roots, dropping the wiggly synths in favor of another dollop of tried-and-tested atmospheric black metal. Experimental Lucan shut up and got back in line. 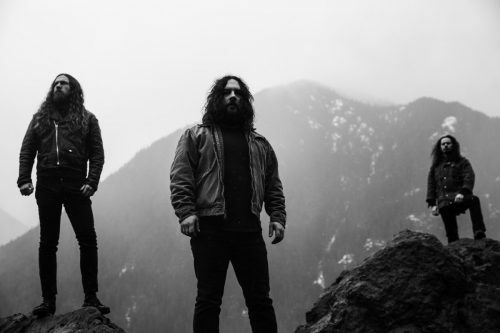 Wolves in the Throne Room have traditionally gone in for a heavily-layered approach, drawing inspiration from the landscape of their native Pacific Northwest region, and with Thrice Woven the band has reaffirmed their commitment to this formula. Through meandering song structures and poignant melodies, they seek to provide the listener with a window into the natural environment of their homeland, recreating the sense of awe and expanse one experiences when surrounded by nature on a grand scale. Generally speaking, they make a reasonable fist of this too. 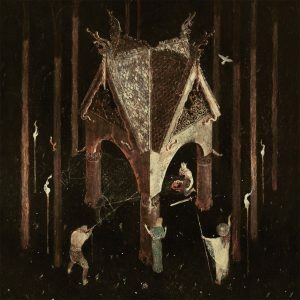 Although it is undoubtedly a black metal record, Thrice Woven’s personality is derived from its folky undertones, which is understated, but all the more effective for it. Opener “Born from the Serpent’s Eye” is quintessential WitTR. Wistful guitar refrains are accentuated by elegant keys—just prominent enough to add depth—and the drum work is unflashy, serving to punctuate rather than distract. About a third of the way in, however, the mood suddenly shifts, heralding a barrage of blast beats and crunchy, downcast black metal riffing, à la Marduk or Gorgoroth. This brief burst of aggression evaporates almost as quickly as it arrives, however, making way for an achingly beautiful choral interlude by guest vocalist Anna von Hausswolff—sure to tug at the heartstrings of any Myrkur or Darkher aficionados in the audience—after which the music eases back into a final melodious amble to see the song out. Now, while “Born from the Serpent’s Eye” is easily the album’s strongest track, this is not the principal reason I have taken the time to break it down. Rather, I have done so because it’s essentially the entire record condensed into nine-and-a-half minutes. See, Celestite aside, I’ve always enjoyed Wolves in the Throne Room’s music, but a criticism I’ve found myself leveling at them on more than one occasion is that it can get a little samey after a while1. This is something that, for me at least, has always prevented them from really breaking into the top tier of the genre’s food chain, and it’s also, regrettably, a flaw with which Thrice Woven is afflicted as well. Don’t get me wrong, the rest of the record is not entirely without merit; a couple of dramatic, albeit slightly cheesy, spoken word segments by Neurosis’ Steve Von Till help to generate a nice atmosphere, and von Hausswolff’s pièce de résistance “Mother Owl, Father Ocean” is genuinely captivating. Furthermore, despite initial reservations, I’ve found myself gradually warming to the production with each listen. Drum tone notwithstanding—the snare has about as much clout as an egg carton being tapped with a biro—the sound is rough enough to carry off the black metal vibe convincingly while retaining enough clarity to avoid congealing when the instruments begin to layer up. Unfortunately, however, this is not in itself enough to distract from the manner in which large portions of the record just sound like the same ideas recycled in a series of different orders, and this is a pity given what a formidable start it gets off to. I’m genuinely glad that Wolves in the Throne Room have elected to re-embrace their black metal nature, but while I certainly don’t hate this album, I do find it underwhelming all the same. Atmospheric music should be an immersive experience, and in its infancy, Thrice Woven is a success in this respect, but the full impact of the record is somewhat stunted by the repetitiveness of its heavier segments, and this saps a lot of the impact out of what could have been a triumphant return to form.